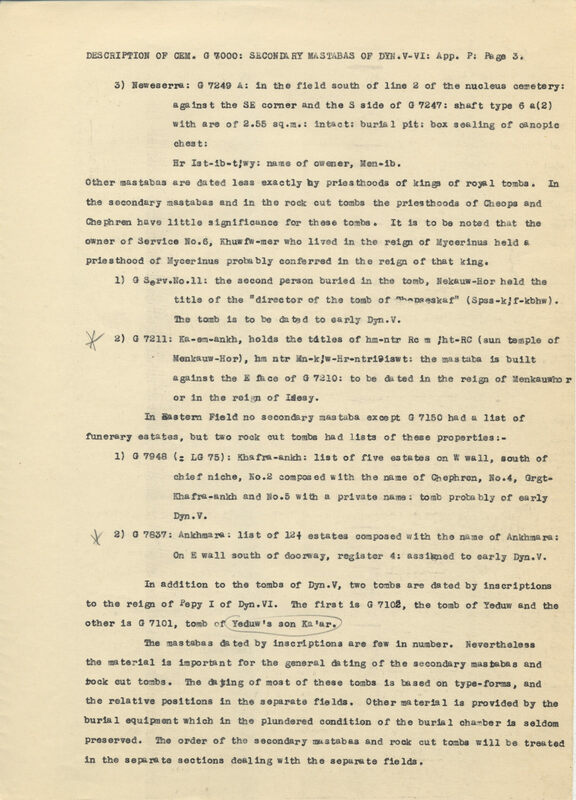 *The original, paper version of this page in “Appendix P: Cemetery G 7000: Part 1: Part 1” can be found in archival box M03 in the Egyptian Section archives of the Museum of Fine Arts, Boston. Remarks Owner of G 7102. Appears multiple times in tomb decoration (chapel relief, architrave, door jambs, statuary), identified variously as [jmj-r Hwt wrt jmj-r sSw mrt xntj-S mnnfr-ppj Xrj tp nswt] overseer of the great chapel, overseer of scribes of the meret-serfs, palace attendant of (the pyramid-town) Mennefer-Pepi, he who is at the head of the king; in situ in G 7102. Possibly same individual as Idu (in G 7101), son of Qar (owner of G 7101). The relationship between Qar and Idu is difficult to determine; it seems certain that they are father and son, but it is not clear which is which since they each have a son named after the other (i.e. Qar has a son named Idu, Idu has a son named Qar). Qar (G 7101) has a sister named Bendjyt who may be identical to Bendjet, a daughter of Idu (G 7102), in which case Idu would be the father of Qar, but this is not at all certain. Remarks Owner of G 7211. Remarks Owner of Service tomb 6. Chapel entrance lintel, drum lintel, and facade inscribed for Merkhufu, identified as [jmj-r jdw n Hwt aAt Hm-nTr xafra Hm-nTr mnkAwra wab-nswt rx nswt jmj-r st] overseer of young men of the Great Estate, priest of Khafre, priest of Menkaure, royal wab-priest, royal acquaintance, overseer of a department; in situ in Service tomb 6. Architrave and false door (south false door) on W wall (because of tomb orientation actually NW wall) of chapel inscribed for Merkhufu, identified as [sHD wabw mwt nswt jmj-r jdw n Hwt aAt rx nswt jmj-r st Hm-nTr xafra Hm-nTr mnkAwra] inspector of wab-priests of the king's mother, overseer of young men of the Great Estate, royal acquaintance, overseer of a department, priest of Khafre, priest of Menkaure; in situ in Service tomb 6. Remarks Owner (along with Ankhwedjes) of Service tomb 11. False door inscribed for Nikauhor, identified as [rx nswt sHD wabw jmj-r qbHw-SpsskAf] royal acquaintance, inspector of wab-priests, overseer of the pyramid of Shepseskaf; in situ in Service tomb 11. Remarks Owner of G 7101. Appears multiple times in tomb decoration (chapel relief, architrave, door jambs, pillar), identified variously as [jmj-r kAt nbt xntj-S mnnfr-mrjjra Xrj tp nswt sS a nswt xft-Hr mAa] overseer of all works, palace attendant of (the pyramid-town) Mennefer-Meryre (Pepi I), he who is at the head of the king, true royal document scribe in the presence; in situ in G 7102. Possibly same individual as Qar (in G 7102), son of Idu (owner of G 7102). The relationship between Qar and Idu is difficult to determine; it seems certain that they are father and son, but it is not clear which is which since they each have a son named after the other (i.e. Qar has a son named Idu, Idu has a son named Qar). Qar (G 7101) has a sister named Bendjyt who may be identical to Bendjet, a daughter of Idu (G 7102), in which case Idu would be the father of Qar, but this is not at all certain.